The Vype ePen is a popular device for first-time vapers and transitioning smokers due to its ease of use and simple design. First-timers often want a cig-a-like experience and this makes Blended Tobacco ePen Caps a popular choice. They simply click into place and the rich tobacco flavour can be enjoyed. One of two tobacco flavours in the ePen Refill Caps range, Blended Tobacco offers smooth and toasted tobacco notes in a harmonious concoction which has a true authenticity about it. 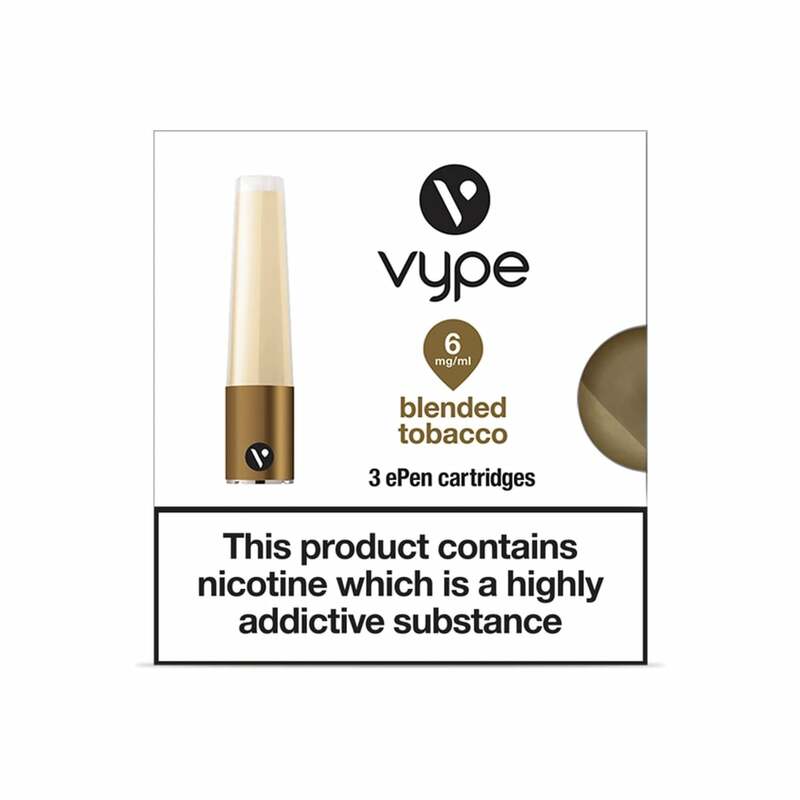 From the popular Vype range, each ePen cap delivers around 360 puffs dependent on your usage and you can choose between nicotine levels of 0mg, 6mg, 12mg and 18mg. A very convenient way to vape nicotine. Not the cheapest but easy and not messy. The vaping device is attractive to look at and discrete in terms of size and shape. My wife, who has ME, enjoys the fact that you don't get a huge cloud of smoke from these. More like smoking a normal cigarette but without the harmful tobacco substances. I have bought some but as yet not tried them. I recently quit smoking and the Vype tobacco flavours have made it a far from difficult experience. Very easy to use, and gets me as close to the old smoking experience as I could expect. I'm a very happy customer! very good quality . no messy liquids .not too strong. Absolutely love these, both for the flavour and ease of use. I am never going to drip eliquid into a device, just want a simple change over at a good price and these deliver that. They're OK but I can't get what I want but this is nothing to do with Electric Tobacconist who are excellent as usual. Keep up the good work. I am finding this hard because I can't say anything about the business who are the biggest problem. A really good selection to choose from,excellent value for money. So easy to order and really quick delivery. Will use again.